HAVING LAUNCHED last year, One Source Live 2.0 presented by Absolut Vodka returns for its second installment. 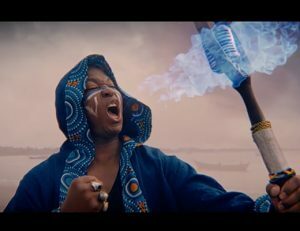 Creative revolutionary Khuli Chana features in the second edition of One Source Live 2.0 presented by Absolut Vodka, on November 17. And legends of the game Bongo Maffin brought the house down- thanks Vodka was flowing yours truly remained unperturbed. Headed by creative revolutionaries Khuli Chana, Sho Madjozi, Trevor Stuurman and Osborne Macharia, will perform at unfolding multiple stages that represent African Creativity as a driver of positive change in the world. Last year, thousands of revelers partied up a storm and one, may ask how would it turn out this year, with international star and inimitable Nigerian musical sensation, D’BANJ, sharing the stage with our own S’java, Distruction Boys and kwaito legends of pantsula Trompies, BET award winning Zulu, and others. Hip-Hop stars Shane Eagle, DJ PH will handle the hip-hop stage. It goes down at its permanent venue: No1 Fox- Joburg.